This summer my family and I are headed to Walt Disney World in Florida. 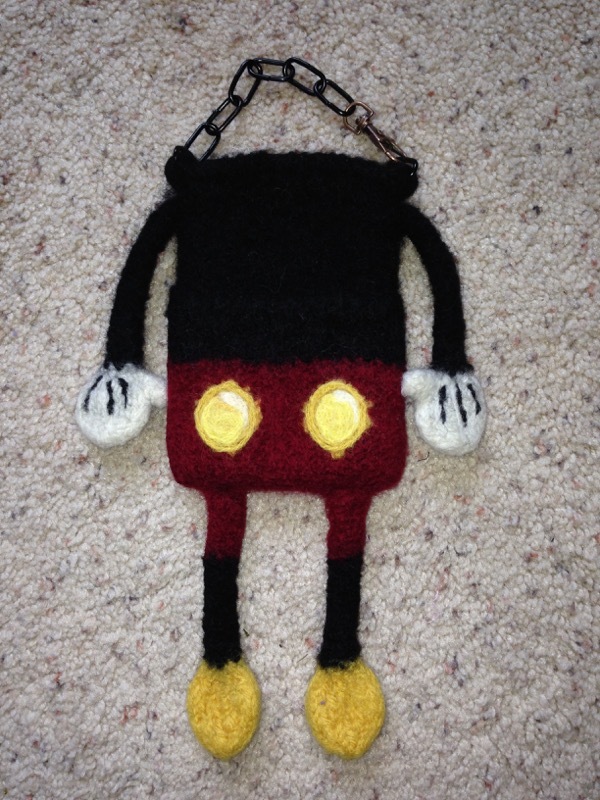 In honor of Mickey Mouse, I thought I would knit and felt a phone case in his colors. I sent a picture of it to my niece before I’d completely finished knitting it and she liked it so much, I decided to give it to her when completed. 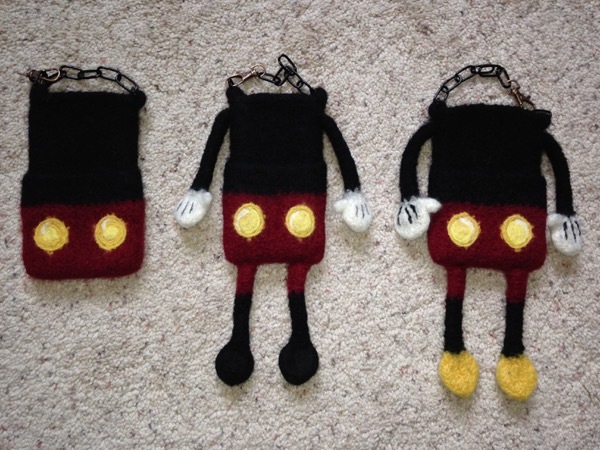 By the time I finished the first Mickey, I had the idea of knitting floppy legs and attaching them to the bottom of the case. When I shared this idea with Hubby, he suggested I knit arms, too. Hmm. More knitting and sewing than I wanted to do, but in hindsight the appendages knit up extremely fast in i-cord. 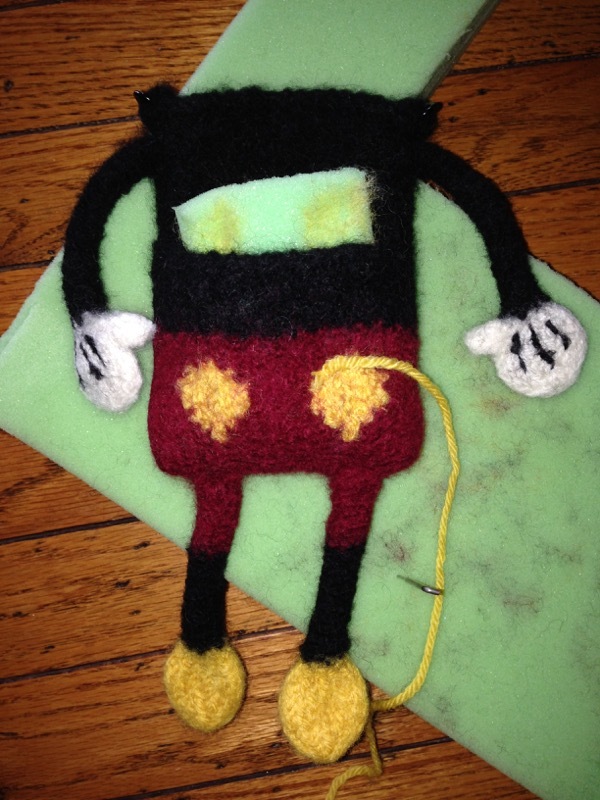 It wasn’t until I had felted my Mickey that I realized something: I forgot to make him with his yellow shoes! 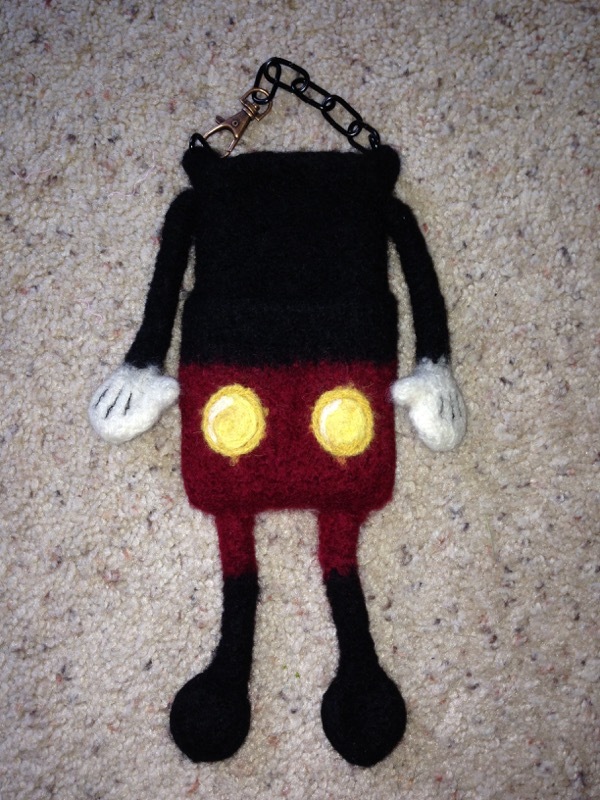 So…when my mom mentioned she’d like a Mickey, too, I figured three time’s a charm and added those yellow shoes. Embroidered on the left; needle-felted on the right. 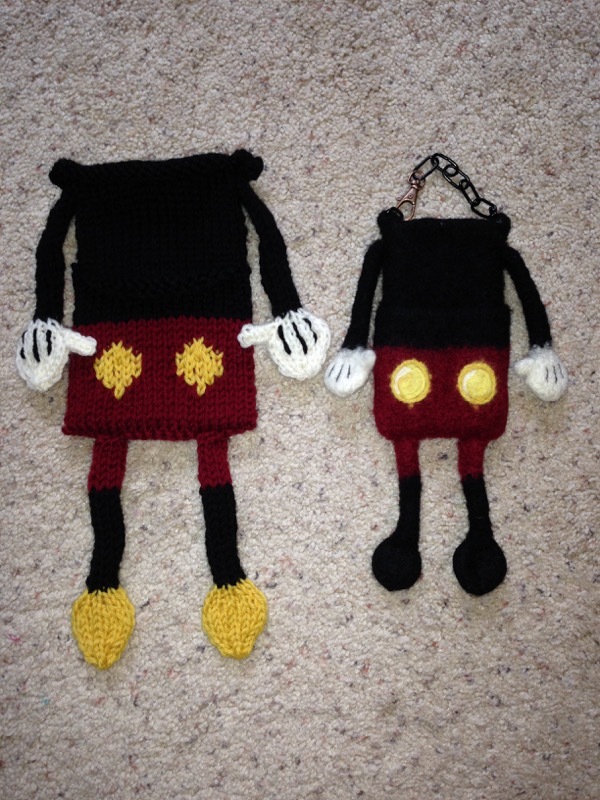 Other than the shoes (and the fact I made hers to fit an iPhone 4 verses mine that fits an iPhone 5), the one difference between my mom’s Mickey and mine are the black lines on the white gloves. I needle-felted mine after the felting process in the washing machine. With hers, I embroidered the lines into the gloves before tossing the case into the washing machine. 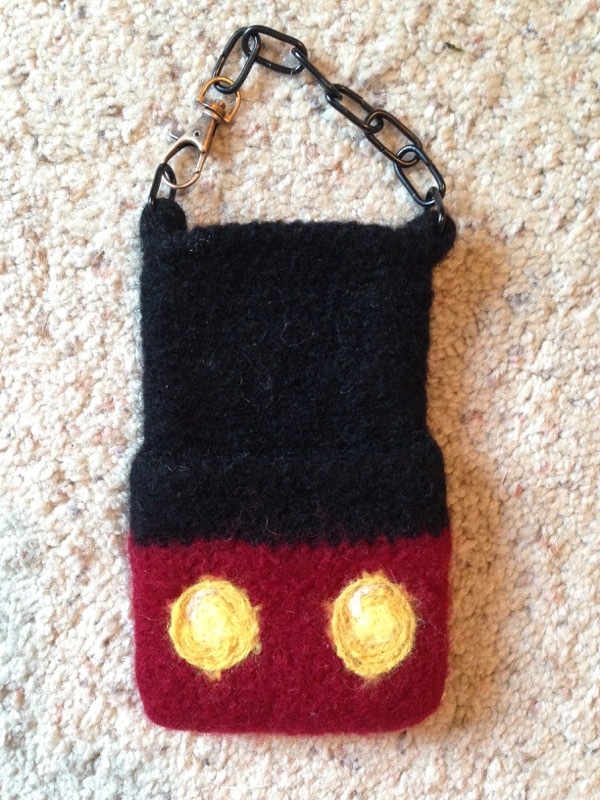 I think I like the needle-felted lines better (sorry, Mom), but I did try to even out the lines on my mom’s phone case as best as I could by bracketing the black lines with white yarn. Live and learn, right? Compare and contrast: pre-felted on the left; post-felted on the right. In the process of needle-felting the buttons. 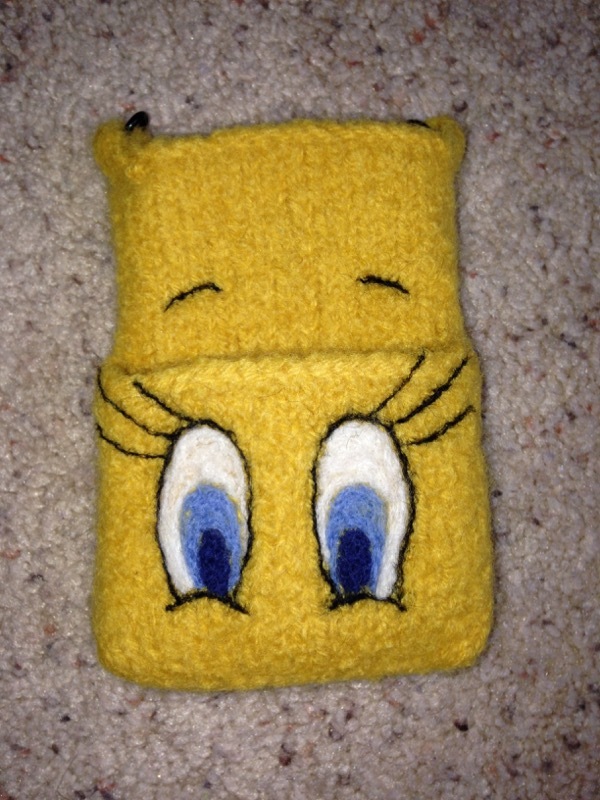 Here’s another phone case I made for a friend who loves yellow and loves Tweety Bird (and it just so happened I had a lot of yellow yarn left over from another project). Lastly, here are two cases I made just for the fun of trying new things. Both of these cases have eyelets instead of knitted i-cord to hold the chain, but you’ll notice with the Paris case that the eyelets didn’t grab onto the felted wool like they should have. I anticipate the same thing will happen to the dragon case with the passing of time and use. Because of this, I’m contemplating making a fabric top edge for these two cases, in which the eyelets should hold and do their job. 😉 I have another reason for sewing a fabric edge on the Paris case, as well. In order to get the vertical stripes, I knit the case sideways—but my calculations were off, so it came out too long in the end. Thus, I had to cut off the top inch or so. That shouldn’t pose a problem…but one never knows, so a sewn edge will keep it from fraying or tearing or whatever felted yarn might do. Now that I’ve mastered this size phone case, I guess it’s on to figuring out the iPhone 6 and 6 Plus…uh, after I make a case for my daughter’s iPad mini, of course.